I have some terrible news to share,with you tonight. I have found out that Randy Stephens, (Buppalo1) has passed away tonight. I don't have all the details but I do know it was sudden and even his closest friends did not know he was in the hospital until today ..
One of his friends saw him today at 1pm and he was weak but seemed fine. Lee Ann and her friend Sammye, a long time friend of Randy, and some family and friends were at his side when he passed. Please keep all of his loved ones in your thoughts.. I am one the road right now but as I learn More I will share it with you..
Like all who post here, I am shocked and devastated. I do not believe I have ever met a sweeter man in my life. I have never heard anger in his voice. His love of life - especially of music cannot be matched. This is just awful, sad and sudden news. Randy was a truly sweet and special man and will be terribly missed. He had such love and respect for music and those who performed and attended events. When I videotaped brother Bill Ector's memorial, I included some "memories' from some of the people who knew Bill. Randy was one of them. Randy actually spoke about how he looked forward to meeting Bill in Heaven one day - Bill meeting him at the gates, "hey, buddy! Come on in!". I'm going to miss Bup'1! This is terrible news. I can't believe this. Randy and I met at last years JFD and became fast friends. I'm in complete shock. Lefty, you and I were talking last weekend as we drove home from the TTB show. We were talking about your transition from Chicago to Alabama and the people who had helped you. You cited Randy as one of the people who helped you connect the dots. Please know that Randy was very proud of his friendship with you. He was equally proud of his relationships with brother Brent "Skyponydogboy" Sibley, John "Bluedad" Howard, Hasija, Big Stephen Mac, BigDaveOnBass, Goliath and so many others. He would beam with delight when he'd tell you that Jack Pearson or Scott Boyer had called HIM on the phone! There was no greater fan of the music made by the Allman Brother's Band and their associated acts than Randy "Buppalo1" Stephens"! "Connecting the dots" was Randy's way of sowing a garden! He was proud of all of his sprouts! R.I.P. Randy Stephens...I can not believe I just typed that. Buppalo was one of the finest and kindest humans to ever grace this planet. He was a true gentleman and a dear friend. He was one in a million and will be deeply missed by all Fly on brother.... I will always love you. This is heartbreaking. And so unexpected. Music has lost a great champion today and many have lost a wonderful friend and this site a piece of its heart. Randy was always such a kind voice here and his pure joy in the music was contagious and lovely. Rest well Mayor Buppalo ... earths loss is heavens gain. Comforting thoughts going out to his family and friends and all of us whose lives he touched. A real great human. He introduced me to Johnny Sadlin one night and we listened to a Jack Pearson song during a break. That was when Donna Hopkins played to Bup, Kay and I in Gadsden. I will miss him. I met Randy at one of the early Jam For Duane's, when it was still in Oneonta, AL. We had merely chatted in passing in the forum, but when we met there it was as if we had known each other all our lives. As I attended others through the years, he always made me feel welcome, although in reality I am just a peripheral part of the community, rarely posting. RIP, Randy. We lost a kind soul. Sums up so much. Quite a feller, quite a feller. I'll always remember Bupp fondly, fine gentelman. I am shocked and saddened. I just spent time with Randy a few weeks ago when we sat with each other for the ABB show in Atlanta. We had a great talk about things. He was walking a good ways around Chastain Park that night and seemed in good health (or nothing I noticed). Bup had a great way of looking at things and connecting the past to the present. We enjoyed many times together over the past decade, including some fun NYE's at The Fox in Atlanta and March in NYE. I wish I knew him even longer. What a guy. Here's last year's JFD thread. The many posts by Randy give you a pretty good idea of the kind of man and music fan Randy was. He went out of his way to introduce himself and to thank me for coming out from California. He loved talking ABB and was like a walking ABB encyclopedia. 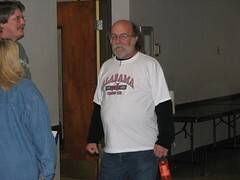 He was a big Crimson Tide fan and he got a real kick that I had seen Alabama play both in California and in Alabama. See post #8 on page 8. I last saw Randy just a month ago at the ABB show at Chastain -- he and I were both wearing "I Miss Bill" T-shirts. He was one of the greatest men I have ever met, inside or outside the ABB community. "Very inspirational to see a couple of our guys off the IR list to make the climb up the hill at Chastain, make it for the show. Tandan and Kyler. Got to meet DanB and Peachnote for the first time, and a few others. And now, I think there's a real chance that we'll all get to do this again one day. And that makes me really happy today. A final thought.....My wish for the band is that they would back off for now. Give Gregg maybe a month to finish healing, then maybe 2 weeks of intense practice, where the band holes up somewhere together. Put on a new face. Climb back to the very top of the hill. People coming out to see .moe, or Santana, or the Brothers for the first time need to see Duane Allman's band in it's full glory. Speaking of which, there was no Little Martha at the end last night. I found this very eerie. Don't know what's up with that. Anybody? I thought coming back about how different I felt than the ride over. Just totally joyous coming back. This music can do that for your soul. This music, and this group of people. eapfp "
What a loss to so many of us He never had a bad thing to say about anybody - always respectful and kind to everyone he met. I will miss his kind soul at all our gatherings. Rest in peace Randy!!!! I'm shocked and saddened to hear this news. Stunned....just stunned. I'm glad to have met and spent time with the Mayor.